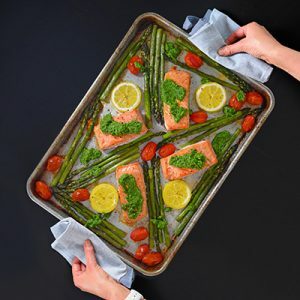 This Sheet Pan Salmon Supper is one of my favorite Whole30 weeknight family meals! It’s so simple to make and clean up is a breeze! 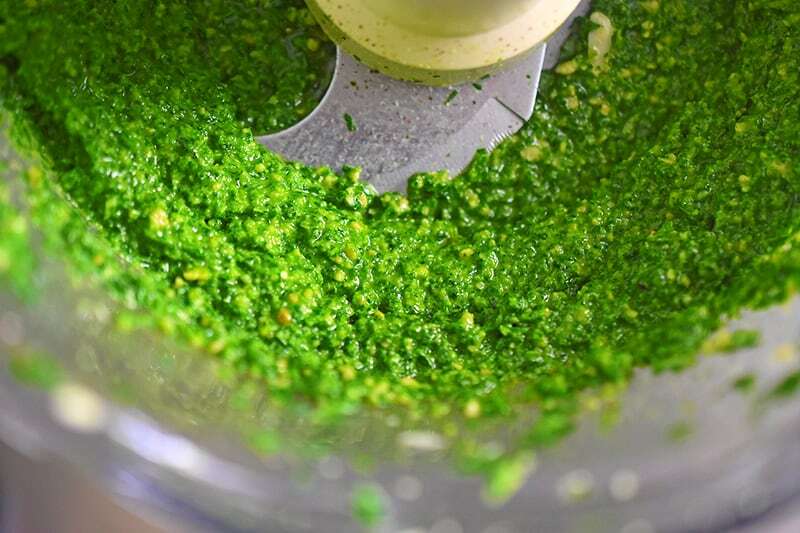 If you read yesterday’s post about my favorite Whole30 Flavor Boosters, I told you that making Arugula Pesto, All-Purpose Stir-Fry Sauce, and Magic Mushroom Powder would come in really handy during this monthlong adventure. All of you who made Arugula Pesto, high five to you! 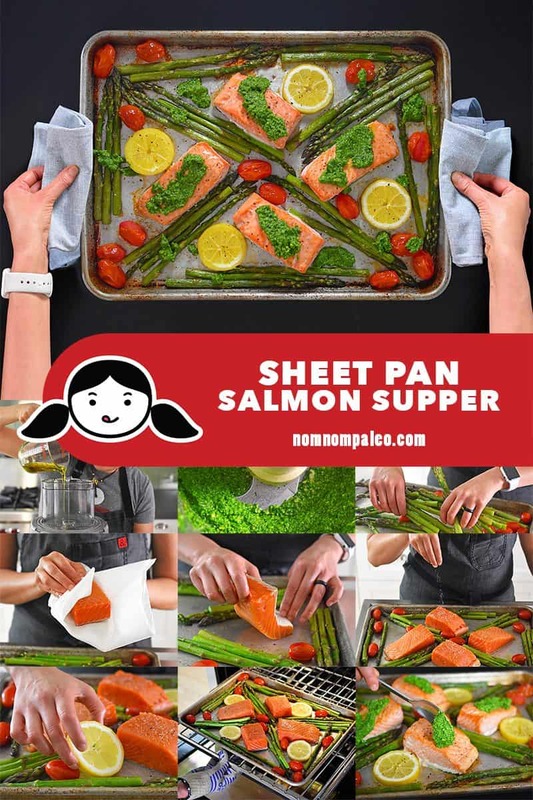 Use it to make this delicious and simple Sheet Pan Salmon Supper! If you didn’t make it yet, don’t fret! My favorite thing about this quick-and-easy one-pan salmon supper is the lightning-fast pesto. 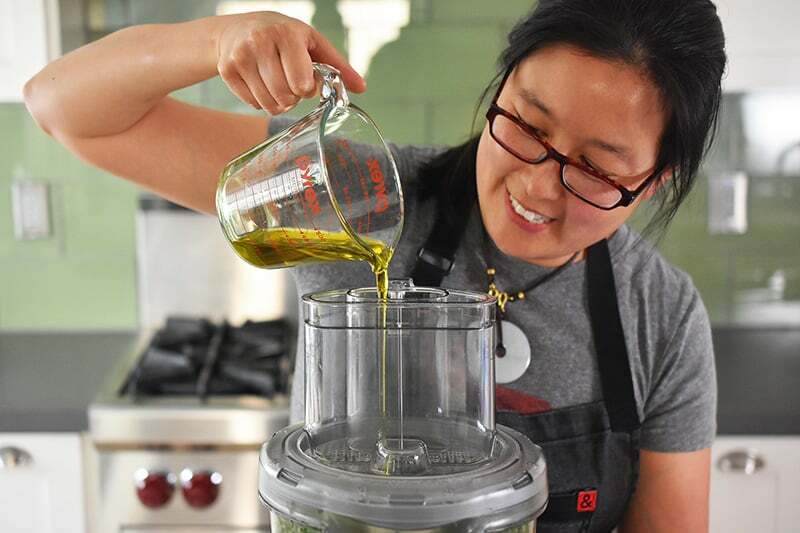 I love that I can toss a bunch of ingredients into a food processor and create a vibrant, verdant sauce that works on just about any savory dish. Grab (or make) some Arugula Pesto. It’ll take just a few minutes! Heat oven to 450°F with the rack in the middle position. 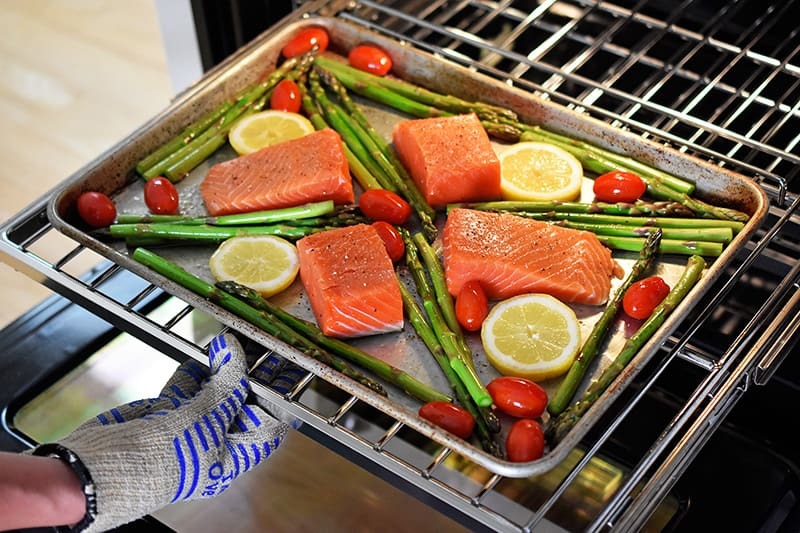 In a rimmed baking sheet, toss the asparagus and cherry tomatoes with ½ teaspoon kosher salt, ¼ teaspoon black pepper, and ¼ cup oil. 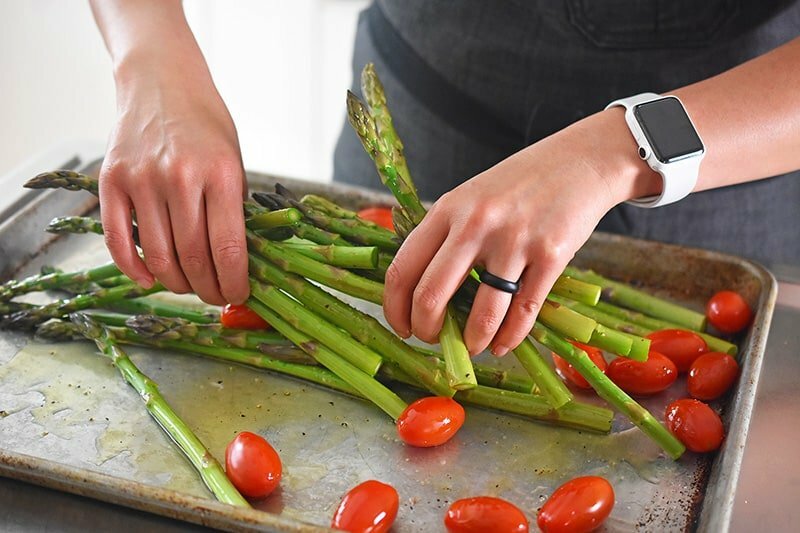 Arrange the vegetables in a single layer. 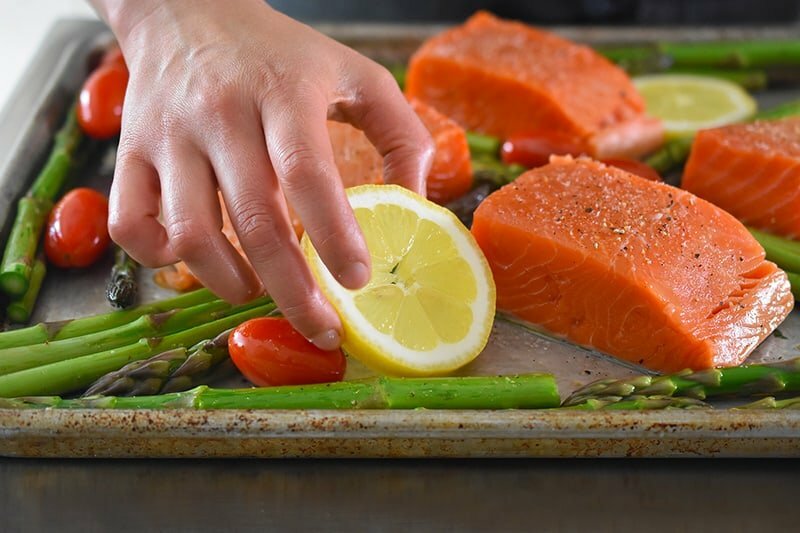 Pat the salmon fillets dry with a paper towel. Place the fillets in the pan and flip them around to coat all sides with the oil. 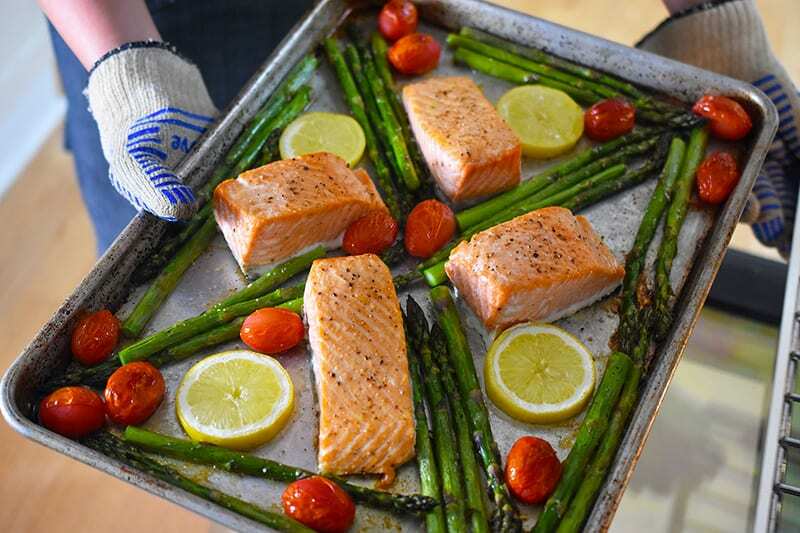 Sprinkle the salmon with salt and pepper on both sides and arrange the fillets skin-side down among the veggies. 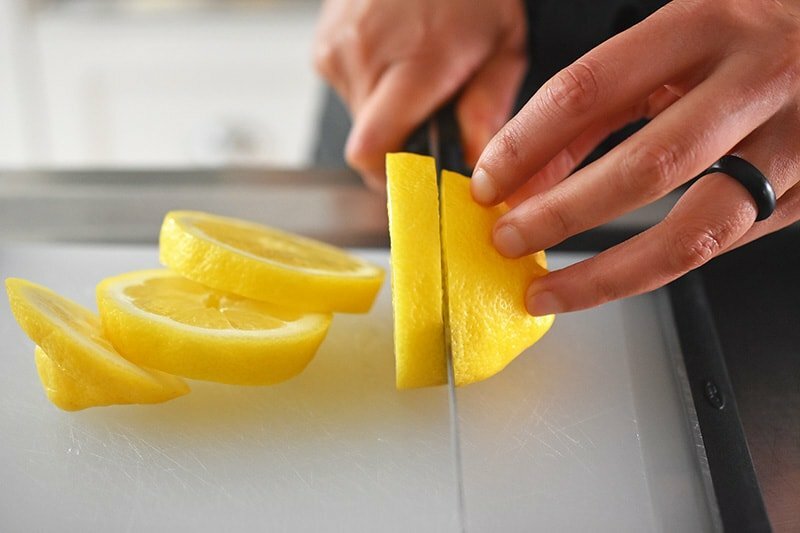 Grab the lemons and cut into ½-inch slices. Add the lemon slices to the pan, also flipping them over to coat both sides with oil. Place the pan in the hot oven. 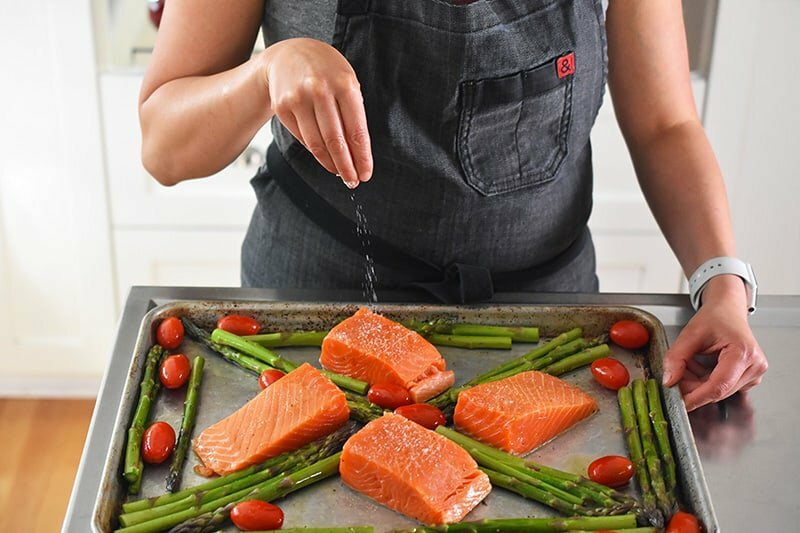 Bake for 10-15 minutes, depending on the thickness of the fillets, or until salmon is cooked to your desired doneness. 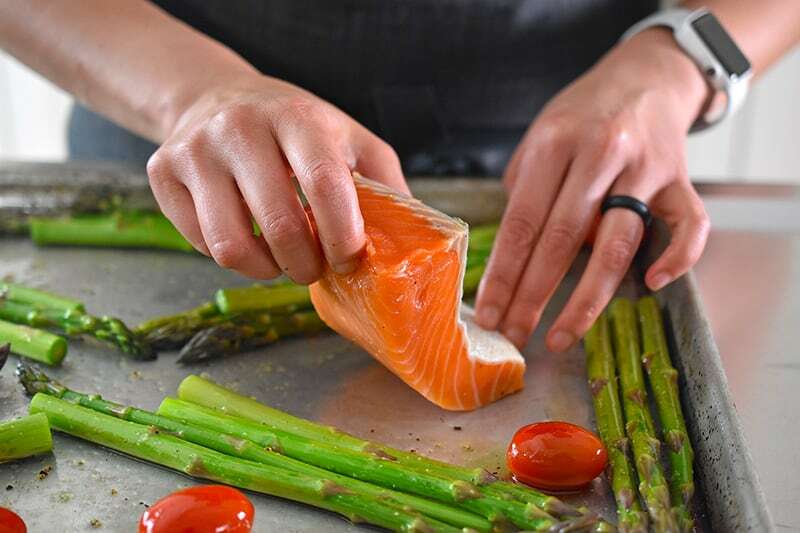 Personally, I like to take the fillets out when the thickest part of the fish measures 135°F on a meat thermometer. 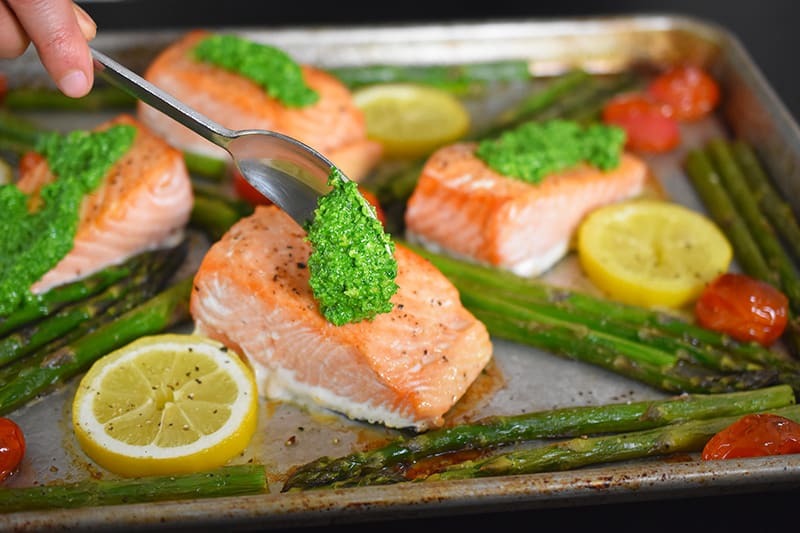 When the salmon is done, remove the pan from the oven, and dollop the pesto on the salmon and veggies. Squeeze the lemons on everything and dig in! Stay tuned for tomorrow’s Whole30 recipe—another delicious and easy one-pan supper! 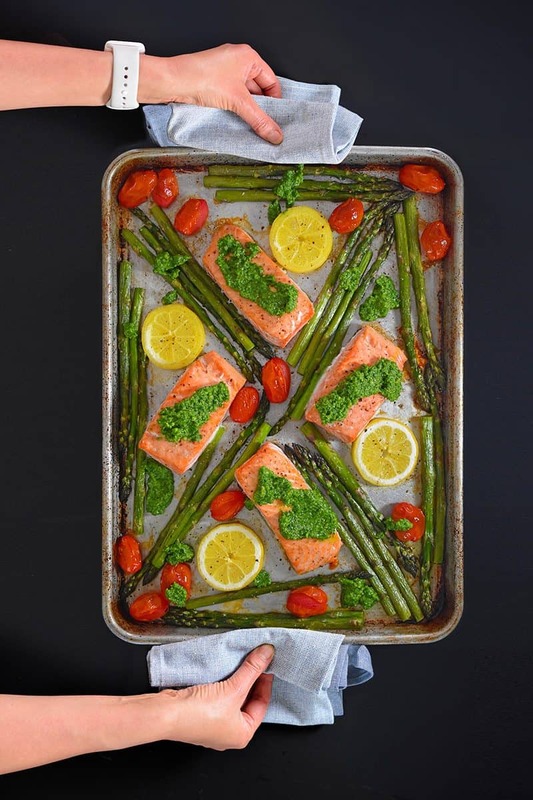 This Sheet Pan Salmon Supper is one of my favorite Whole30 weeknight family meals! It's so simple to make and clean up is a breeze! 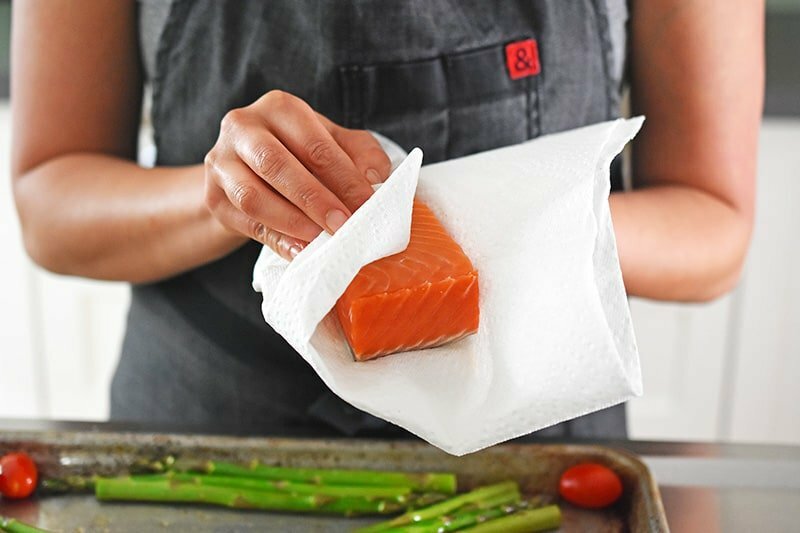 Pat the salmon fillets dry with a paper towel. Place the fillets in the pan and flip them around to coat all sides with the oil. Grab the lemons and cut into ½ -inch slices. Add the lemon slices to the pan, also flipping them over to coat both sides with oil. If asparagus is out of season, broccolini is a great substitute!